Say “Yes” to a $15.00 Minimum Wage! The minimum wage in 1963 was over $15.00 per hour, so why not return to those rates? 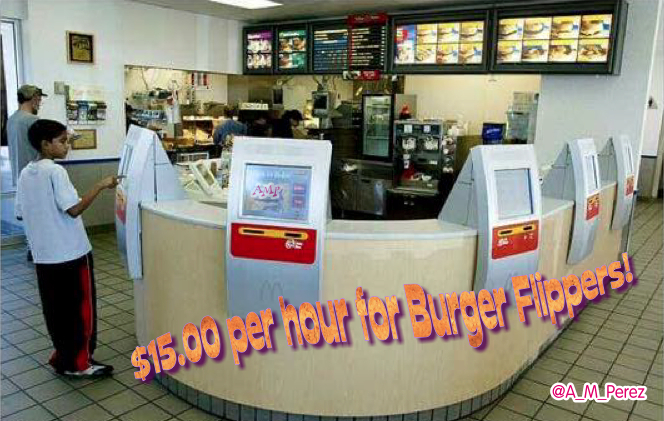 Let’s give liberals what they want and raise the minimum wage to $15.00 per hour and even more! So, how do we do this? Should Congress just vote to raise the federal minimum wage and let Obama sign it into law? Of course not, a federal minimum wage is flat out unconstitutional. There is absolutely no enumerated power in Article 1, Section 8 of the Constitution which allows Congress to legislate mandatory wages for employees. Now that I appear to have gone completely bonkers, it’s time to explain. The minimum wage in 1963, setting aside its unconstitutionality, was actually $1.25. Adjusted for inflation, that is $9.49 in 2015 dollars. The current $7.25 minimum wage is equal to 92 cents in 1963 dollars. Inflation has gone out of control, because any time the federal government wants, it can just print more money. Doing so automatically devalues all of the rest of the money in circulation. Your wealth is quite literally stolen from you when more money is printed. You still have the same number of dollars, but their purchasing power drops. While the United States was on the gold standard, you can see that the price of gold barely changed from 1792 to 1932, never budging from the 19-20 dollar range. Gold holds its value fairly solidly over the course of centuries. In 1933, Franklin Delano Roosevelt took the United States off of the gold standard, so paper currency was no longer backed by anything of tangible value. The federal government unconstitutionally outlawed the ownership of most gold coins and bullion, demanding that everyone turn it in to the Federal Reserve for the current price of $20.67 per ounce. Once the government had a virtual monopoly on gold after rounding it all up out of private hands, they arbitrarily set a new price of $35.00 per ounce for gold. It was magic! Suddenly all of the government’s gold almost doubled in value! Beginning in 1964 the United States began removing silver from our coins. All of our coins dated 1964 and prior, with a face value of 10 cents or more, were 90% silver. The half dollar coins continued to contain 40% silver though 1970. The last of the silver was removed from U.S. coins in 1971. The last driblet of actual value was stripped from the currency. Sure, the federal government still set a value of $35.00 for an ounce of gold, but they had all of the gold and the people couldn’t buy it. It was still against the law to own it. At least having the set value stifled inflation. 1971 got worse! Without a drop of silver left for the people, Richard Nixon put the final nail in the coffin of the gold standard. After all, the government can’t inflate money by printing more if they have a fixed price for gold. Even though people couldn’t buy the gold, printed money had an artificial value that didn’t waver, because of its pretend gold backing. Nixon removed the government fixed price on gold, completely severing any real value from printed money once and for all. If you refer back to the chart of gold prices from 1792 – 2014 you can see the sudden skyrocketing price of gold beginning in 1972. At first glance it looks fantastic, but other than some gold certificates that started being legal to buy in 1964, no one had any gold to sell as the price rose. The price didn’t rise because people valued gold more. It rose, because the Federal Reserve was printing more and more money. The value of gold versus any other general commodities remained the same, but the number of dollars needed to purchase those commodities rose. Amazingly, in 1975 when the price of gold hit $139.00, seven times what the Federal Government bought it all for, it became legal to own gold again. Now gold was for sale, but there was only one major seller: Uncle Sam. This makes me wonder if there is anything left in Fort Knox. That’s a question no one can honestly answer and a conspiracy not worth delving into right now. What does any of this have to do with a $15.00 minimum wage? The five quarters that made up the $1.25 minimum wage in 1963 were 90% silver with a 2015 melt value of over $15.00! Reversing all of the damage the federal government has done to our currency since 1933 would put a real value back on our money rather than the artificial value the Federal Reserve places on it. Dropping the minimum wage back to $1.25 per hour and minting our coins from silver again would immediately put more wealth in the hands of burger flippers than the current $7.25 in Monopoly money they currently earn. It is always easier to do damage than it is to repair it. Reversing the direction the government has taken with our currency and going back onto the gold standard could have some growing pains if deflation were allowed to happen. It would have to be done relatively slowly and in managed stages. Deflation can be worse than inflation. As money becomes more valuable, debts become more of a burden, because wages go down. We are a nation of people who love our debts. Debt isn’t necessarily a bad thing. It’s because of our ability to go into debt that we can afford to put mortgages on houses and cars and pay for them over time. If you have a debt such as a mortgage, inflation makes it easier for you to pay over time, because money is less valuable and you have more of it, and your debt doesn’t inflate with the money. Debts couldn’t remain static when facing a large deflation or everyone would lose their properties even as their monetary wealth remains the same. This is why the deflation would have to be managed to decrease debt at the same percentage that increased value in money decreases our incomes. Going back onto the gold standard and managing the deflation that would come along with it, especially with the return of silver coins, is one solution, but quite frankly it is an unconstitutional one. It wouldn’t be advisable to repair damage that was done unconstitutionally, by doing something else unconstitutional. The federal government has no enumerated power to decrease the debts people owe one another just because of deflation. There is another solution, which passes constitutional muster and would take far less time. It could even be painless. Congress is empowered to coin money. They can also regulate the value of money. These powers are expressly enumerated in the Constitution. There are several reasons we can’t change the name of our money, but we could replace it. If we were to go back onto the gold standard, Congress could print Dollars 2.0! The gold price could be immediately set to $20.00 per ounce and all U.S. dollar wealth and debts in existence adjusted accordingly. It would be perfectly fair, across the board. Liberals love fair, right? They would also love the fact that there would be no more billionaires. Even people who hoard gold and other commodities would remain unaffected. Their wealth would remain intact. The value of everything would remain the same and it would stay that way. Any value could be set in stone for an ounce of gold with Dollars 2.0, I just like $20.00. This rate would drop the current $7.25 minimum wage down to about 4 cents per hour, but it’s all relative. I think 4 cents per hour is the perfect minimum wage! Thank you to http://onlygold.com/ for their wonderful chart of historical gold prices! Previous Don’t let Republican Primaries Divide us! There were many such acts including also one in 1792 to provide for copper coinage. In 1900 there was another act to get off of a multi-metal system and go strictly on a gold standard. I don’t care what metal or material we use to base our currency on as long as it is something besides thin air, which is what the dollar is backed by now. I am uncertain about this. The constitution reads in pertinent part, “The Congress shall have Power To…coin Money, regulate the Value thereof, and of foreign Coin…”. I understand what coining money is, but how does Congress “regulate the Value thereof” and how does it do so to “foreign coin”? The foreign coins were not coined by Congress, so how does that work? I notice the constitution uses the word “dollar”, so it could not be talking about the monopoly money we use today that say “dollars” because there was no FED at that time. This must be answerable. I call upon the Gods. They can’t regulate value of metal such as gold, only how much gold would equal a dollar. The dollar was 18-19 bucks forever until we came off of the gold standard. The value of gold didn’t change. The value of the dollar changed. While it was $18 per ounce, Congress could have, for instance, changed gold from being an 18th of an ounce to a full ounce. They could then have minted coins out of 1 ounce of gold that said $1 on them. That wouldn’t change the value of gold at all or it’s value against any other currency on Earth. It would only change what we call that increment of value here in America. This is unclear to me, and believe me, I am not alone as I have discussed this with many who are trying to solve the riddle. You said “The dollar was 18-19 bucks forever”. So at that time you refer to, if I put a “dollar” on the table along with the “18-19 bucks”, what exactly was I looking at? I assume the “18-19 bucks” are the paper currency we use today (correct me if that is not what you mean). But what was the “dollar” next to the “bucks” (paper money) on the table—was it silver, gold and how much of it? The dollar is nothing. I used the term dollar and buck interchangeably. My point is that a dollar is only what Congress says it is. The only reason we put any value at all on a dollar today is because everyone believes the federal government will back it. Back it with what? They have nothing that is worth the value of all the money they have printed. Every time they want more money, they just print more, which devalues they money you already have. That’s what inflation is. If the dollar were backed by gold as it used to be, inflation is impossible. They can’t print more dollars than they have gold to back. It’s gold people actually value, not a piece of paper. Right now, we have no gold. We only have paper, paper, paper, and more paper. And it’s only worth what we are fooled into believing it’s worth. Check out these links. Very well researched and footnoted. Very educational. Congress cannot “print money, as you suggest. There is no power enumerated to Congress to “print money”, so it doesn’t exist. One battle at a time. Of course I only want them to coin money and then only of gold and silver. We aren’t going to stop them from printing money. The Continental Congress was printing money before the revolutionary war began and the practice has never stopped. The first printed money in the Western World was in 1690. The money was supposedly backed by gold and was considered promissory notes, not money as we think of it today. Today people place a value on the paper, which is meaningless. Congress can print money. They do and always have. Whether they MAY is the debate to have. They can do a lot they aren’t allowed to do. Almost everything Congress does anymore is unconstitutional. I have never understood, how was the United States ever on a “gold standard”? The constitution reads, “no state shall…make any Thing but gold and silver Coin a Tender in Payment of Debts”. So both silver and gold are to be used. I see no “gold standard”. Am I missing something? Where does “gold standard” come from? I think it just means that the paper dollar was linked to gold by price, not silver, even though silver currency was was also used. The prices of either barely fluctuated when our currency was backed by gold. Also, it was gold, not silver, that backed paper currency. At least as far as I know. As usual, your writing style is top notch and entertaining, but I have to admit, the mysteries of macro economics always escaped me. I have trouble balancing my checkbook. Still, the manipulation of our currency sounds vaguely illegal on it’s face and spreading the word might wake some of us up. Thanks! Basically, a simplification is that the only way to ensure that wealth is worth anything at all is for it to be based on a tangible asset. Congress can’t print more gold, thereby devaluing your gold and stealing your wealth. Be sure to read. great article. The “YES” is tongue in cheek. My husband and i have always said that we should go back to the gold standard and removing it was disastrous. Sounds like a great plan. To bad it will never happen. And you stated why. It will effect the billionaires and they are the ones in control of the politicians and judges who determine what is and is not law. So us little guys, we the people, are forced to play their games. Or opt out, which seems the more legitimate course of actions.